As part of our continuing commitment to improve our data services and your experience on our web site, we have upgraded our data applications to introduce a single log in. Some restricted areas require that you have additional permissions; should you encounter one of these you will be informed whether your account satisfies the entrance requirements. After a period of inactivity, to keep your account secure, your session will time out and access will be closed. You can also opt to close your session at any time, using the log out link presented at the top right-hand side of our web pages. This completes a major step towards our aim of making all of our data holdings accessible online. 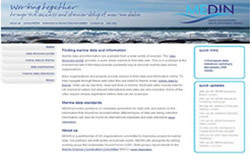 The Marine Environmental Data and Information Network (MEDIN) web site (http://www.oceannet.org/) has been relaunched with a new look and added features. MEDIN is a partnership of UK organisations, both public and private sector, committed to improving access to marine data. It sits alongside its sibling working group the Underwater Sound Forum (USF) and both groups report directly to the Marine Science Coordination Committee (MSCC). MEDIN are establishing a network of marine data archive centres (DACs) to provide secure long-term storage for marine data. This network will provide the capability to upload and retrieve data. 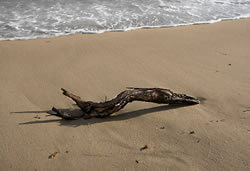 The OceanNET web site provides details on how, and to whom, data should be submitted. For ease of discovery and use of data, standards are essential and MEDIN has an agreed process, involving key stakeholders, to approve standards for use by MEDIN partners. 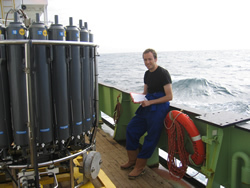 The OceanNET web site provides access to these agreed standards, along with MEDIN meeting details, articles and a range of publications for download or hardcopy request. Users can subscribe to MEDIN’s e-newsletter, Marine Data News, as well as downloading Adobe PDF documents of past issues.